Born on a "petting zoo" that was also a pork farm, a tiny pig named Eric was never meant to live very long. Things, however, took a turn for the worse when his back leg was injured and became infected and Eric was left on a barn floor to die. Fortunately, a concerned mother and daughter saw the trampled piglet and begged the farmer to let them have Eric. 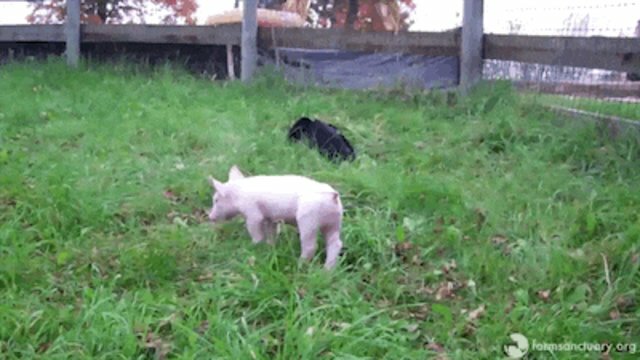 Dismissing the tiny pig as a lost cause, the farmer agreed and the Good Samaritans took Eric to Farm Sanctuary for treatment. Using antibiotics, veterinarians were able to save Eric's life, keeping him under close observation while he recovered. During that time, Eric met a stuffed pig named Gundy that would soon become his best friend. "Gundy not only snored and vibrated when he was squeezed, but the stuffed pig also provided a cozy bedtime companion," writes Farm Sanctuary on their website. "Eric lovingly spooned this stuffed brother at every nap and night's slumber." Farm Sanctuary on Instagram: "Eric's first friend was his stuffed pig Gundy Gunderson. But he would learn real pig relationships are more complex. Bit.ly/Meet_Eric_Pig"
After weeks of treatment, Eric was separated from Gundy and introduced to other pigs, but Eric had trouble fitting in with herd. No matter how much he ate, Eric stayed weak and skinny, and he was often picked on by more aggressive pigs. Eventually, Eric was split off from the main group to live with the chickens, where he was soon joined by another pig with health problems. That pig, named Bob, would go on to be Eric's "real-life Gundy." 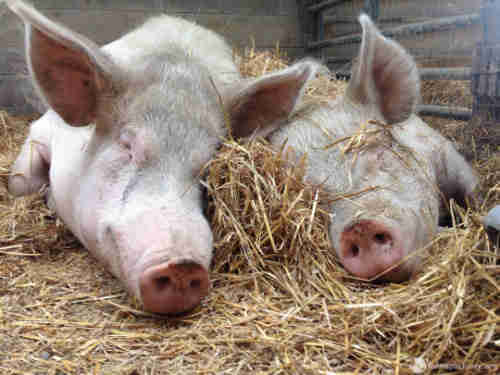 Eric and Bob are now content and stress-free, according to Farm Sanctuary staff. Rejected twice over, Eric finally found another pig that would accept his affection - love he first gave to a stuffed animal named Gundy. To help Farm Sanctuary save animals like Eric and Bob, click here.